How fitting to write this today, on my anniversary of 20 years of starting yoga! Yep – August 11th, 1998, just a few short months after my mom passed away. I took a class on the advice of friends to help my grieving, and never looked back. I instantly knew that Bikram yoga would be something that I would continue to do, but it wasn’t until a plane ride to a family reunion two years later that I also knew I would make this a livelihood. I had picked up what I had thought was a seminar brochure when, in fact, it was a packet of information on Bikram’s Teacher Training. I put it under my seat, disregarding the information, only to think about it non-stop on that 5-hour plane ride. When I landed, I knew I was going to take that training. I’m lucky to have worked in companies with people and mentors that were sharp, caring, and successful – sharing with me both their expertise and their passion for their work. I knew that after Teacher Training, I could take the experience of expertise and passion and build a business around that here in San Jose. Only two obstacles- I had little money, and not much support on how to open a studio. Back then, the term “yoga” was still being referred to as “yogurt.” If you know me, you know I am comfortable with taking risks, but what you may not know is that faith is the source that allows me to override the vulnerability of risk. Two years after I was certified as a teacher, we opened the doors to BYSJ in January 2003. It wasn’t pretty: we failed so many inspections from the city of San Jose; during a huge rain storm with an electrical outage, burglars stole our new computers and a sound system; we had to pay an unexpected utility tax of thousands of dollars. But I never lost the driving force of why I was doing what I was doing. I watched this yoga do so much for everyone who came to class. It was beyond anything else I’ve ever experienced. It served the individual and mankind, simultaneously! One night, as the contractor and I were painting baseboards, I found a ring on the cement floor with the words “faith” wrapped around it. Circumstances would tell you it was wrong, but a higher, unknown presence knew that it was right. And here we are today. From then until now, 12-13 years, I’ve practiced nearly everyday. As you can imagine, I’ve grown so much with this yoga, with this place, and with all of you! 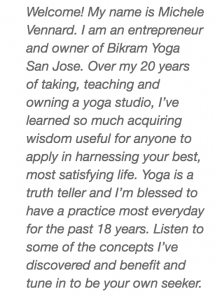 So on this, my anniversary of 20 years of yoga, I thought it would be interesting to share a few key points of wisdom that I’ve acquired as a student that might inspire those of you on the same path. 1. Do this practice often! This yoga is a healing modality. You won’t see the changes you seek if you only practice casually. At first, this may sound like a marketing ploy. (Spoiler Alert: It’s not!) It truly is exactly how the teachers share with you: like brushing your teeth everyday or taking an shower each day. Of course it’s super hard at first. Not just the practice itself, but finding ways to get this into your daily schedule. But over my 20 years, I am always amazed at I have seen thousands of people on the same trajectory. They start infrequently, full of obstacles in the way. Over time, yoga fits in no problem, without a thought. Trust that over time the universe will show you a way and, like me, you’ll get there! The practice itself does get “easier” as I’ve learned what to expect, but it is still tough each time. It GIVES me the challenge I need that day so that I’m more free in my body and my mind. Honestly, I access my most effective and kind self as a result. For beginners it seems counter-intuitive, but even Rajashree will tell you–come MORE. She says that it takes a good six weeks of regular practice to even begin to talk to our nerves. Tony Sanchez, Yogi extraordinaire, will tell you that it takes two months to start to acquire changes in the body and in the mind. So, take advantage of your membership and come A LOT! For me, Bikram Yoga has been the gate and the game to being what I know I can be, bar none. It doesn’t matter what the class holds for you that day as regardless, it’s giving you what you need – everyday. Yoga progress is always on time, and coming each day will advance your patience in the process, which advances your patience in your LIFE. Remember, this practice isn’t about changing your body, although it will (and in the best way). Bikram Yoga is about changing your life, which is a lot more valuable and ultimately more satisfying! You’ll grow in ways you wouldn’t have imagined, a type of growth that yields a life of fullness and integrity, arising a spirit in you that is bold, alive, and connected! 2. Be open. Be smart. Bikram yoga is taught from a dialogue instilled in teachers when they train with Bikram. The dialogue serves as a road map that, when said properly, navigates you around the world that is your body safely. The 100% right way guarantees progress. I know because my first year was HORRIBLE! I did not follow the instructions, and my ego was determined to kick out on a bent leg. Over time, I started to listen. Only then did I feel good and start to see some results. My job at the time had me travelling, so I was forced to take classes at different places and with different teachers. Despite teaching essentially the same thing, you will “hear” different things from a variety of teachers that will stand out to you, bringing comprehension beyond the usual understanding. These are those “A-HA!” moments when you connect your mind with your body. “That’s the gold,” as our own Brad Fire would say. It’s a different kind of awareness you are creating that only YOU can achieve with these precious self-discoveries. So, embrace the different teachers and be open to their delivery of the dialogue. Get in the room like everyone else, and make the discovery to make the connection. That way it will stick and you’ll prosper in self-realization (the true gold). Our next Beginner’s Workshop is with Joseph Encinia, Sept 15th! Check out our events page to sign up now! On that same note, go to posture clinics or workshops offered at BYSJ or other credible studios. Make it a point to go to at least one or two a year! They will propel your practice onto a new plane. Attend, learn as much as you can, then play around with all that information for the next six months or so. Clinics and workshops are intended to give you personal corrections and tips. Bring your questions and prepare to demonstrate a pose to get corrections. I’ve taken so many clinics and workshops from such great teachers around the globe, and each one has influenced my practice! I’m grateful, but it will only work if you keep an open mind. I remember years ago, on a Bikram retreat with about 100 other yogis, Bikram being extremely upset on the podium. He was telling us a story about his friend, Quincy Jones, and his dilemma in getting several artists to work together on a new song. You could say there were too many coaches and not enough players. Bikram’s advice to Quincy was to tell them to leave their shoes at the door, meaning take off the usual lenses, and allow for new perspectives to come through by listening to each other. Bikram kicked out one of the students that day because he felt this person was wasting their time and money if they weren’t going to enroll in acquiring some new information. He was right. What was the point of that student being there? So when you sign up, commit to true learning. Have the grace to do as that teacher says and reserve judgment for a much later time (if at all). We are too quick to dismiss information which, left unfiltered, could be key to our advancement. Here’s a caution though: be careful following the rule of thumb that says, “I’ll do what feels right for me.” I hear that a lot and, while there is room to justify this, we don’t often get what we need by doing what we feel is right. What is ‘right’ is not easy or quick to discern. I can give you countless examples of doing what feels right in my practice and getting NOWHERE. You could say the same for progress in your life, too! Remember yoga is about transformation, and change rarely feels good or feels right initially. More true to me is the phrase, “If you want to go somewhere different, than you have to do something you’ve never done before.” Most of the time, doing something new will feel hard and even wrong. One of the best gifts you’ll get out of yoga is the ability to discern. Discernment is the mature way to view situations by seeing the emotional, mental, physical, and even the judgmental influences, and then adhering to a decision that is unbiased. Discernment leads to a choice serving your higher good. That is smart! Go there! With that said, I’ll add a rule of thumb of mine that came as a result of discernment. If I’m injured, I’ll practice in the back of the room. As many of you know, I like the front row but I also know that I’ll push more up front, disregarding the needs of my injury. My mature ‘higher’ self knows it’s best to practice in the back where I still work hard but keep to the healing priority that my body needs at that moment. 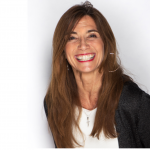 Discernment is the muscle you exercise to build integrity – watch how yoga teaches you this life-succeeding characteristic. 3. Be still. Lean back. Work hard. Do a double. WHAT?! This class has so much yin (be still, lean back) and so much yang (work hard, do a double). Some classes will feel more yin and some classes will feel more yang. It’s 90 minutes in sequential order to help center the active and the inactive. I don’t necessarily believe that we can achieve a balanced life as much as we live striving FOR a balanced life. There are too many uncontrollable factors in any person’s life, but with yoga you’ll be calm when you are active and assertive even as you are at peace. Learn to be still after every posture. In other words: no wiping, water, or fussing. Take the savasanas – all of them, especially the last one. Be the first one in a pose and the last one out of a pose. Occasionally do a double and notice how warmed up the muscles are and how quiet the mind is. Play around and explore, only to refine and do less. We use the mind to train the body, so also watch how your mind will surf everywhere only to come back distilled and crystal clear. People ask me if the mind ever shuts up. Does that critical voice disappear? Do judgments and anxieties subside? I heard a message once explaining how fear “moves.” Fears or anxieties change from one thing to another. This tells you those fears are circumstantial, and more significantly, temporary. In my opinion, that “voice” doesn’t go away but it gets MUCH quieter. It may have something to say, but it becomes a piece-a very small piece-in the pie of information you hear. Let these thoughts stay thoughts that we/you are in control of. Then they don’t control you. If you trust the process, go the long haul, then you, like me, will have a quelled, sharp mind that gives you information sorted through your extreme awareness of all the filters you’ve carried since you were born. In direct proportion to your awareness of your thoughts is the discretion of your heart! Your acceptance of what you learn about yourself feeds the soil of what it takes to love yourself. In my 20 years of Bikram Yoga, I’ve come to see that change, TRUE change, can’t happen until you first love who you are. I’ve seen this not only within myself, but with all of you members. I didn’t say ‘like,’ as that is different – there are plenty of things we may not like about ourselves. But the success of your living a life well-lived springs from the seed of self-love you carry. There is this quote in the Bible that says with affliction comes endurance; with endurance comes character; with character comes hope (Romans 5:4). When I had my appendix out at 41, they told me I had the body tissue of a 24-year-old. I temporarily lost my period for nearly a decade after my mom passed away, yet my bone density still rivals that of a 17-year-old. I am 54 years old, but I have a flexible spine. I can still eat things I enjoy, without worry. This all happened because I was sick and tired of being sick and tired (affliction). I practiced endlessly despite setbacks with hamstring pulls, sciatica, headaches (endurance) and built character through personal loss of loved ones, financial hard times, and emotional traumas. Today, I’m hopeful and excited for what I can contribute in my years ahead, given my abundance of awareness and faith. Yoga has unfolded in me a spirit beyond the natural realm. My final tip: 4. Make yoga one of the most important things in your life! All else will rise, too!